According to Caroline Fredrickson, author of the newly released “Under the Bus: How Working Women Are Being Run Over , the majority of the lowest paid and insecure jobs in the U.S. today are held by women–especially women of color. As income inequality grows, this ‘service sector’ is growing even faster. And while labor protection laws, such as overtime pay and equal pay for equal work, have been passed in the U.S. for over 100 years, they have been purposely crafted to not include these many women and minority workers. During The New Deal, FDR traded away rights of domestic workers, farm workers and others in order to secure votes of southern Democrats for labor benefits that would accrue to white males. Today as a result, women holding low wage jobs, such as home health care aides, nannies, manicurists, housekeepers, waitresses, domestic workers, ‘independent contractors’, and ‘temps’, have zero worker protections and struggle in abject poverty and insecurity. Women are 63% of minimum wage workers, 73% of tipped empoyees, 86% of personal care aides and 63% of part time workers. These sectors are predicted to grow, as jobs are further outsourced and the U.S. industrial base is further hollowed out. While Cheryl Sandberg, Facebook CEO has written in her much sensationalized book on women and work: Lean In that women just have to “lean in” and be more aggressive about “asking for that raise” if they want to get ahead, Fredrickson provides poignant examples of another world in which a nanny or Walmart worker who asks for a raise–or day off to care for a sick child–is likely to be summarily fired. In her last chapter, “Leaning Together”, Fredrickson recommends some of the reforms of a universal (not piecemeal) nature that need to be made to fix this shameful situation: getting rid of the exclusions to the New Deal that left so many out; extending benefits to workers in small businesses, temps and part time jobs; indexing the minimum wage to the cost of living; professionalizing the care industry; providing childcare and family leave–for starters. The show will also feature an interview with Stephanie Huffaker, a member of National Women’s Liberation, the group behind the re-emergence of the vintage Redstockings‘ 1969 sticker: “THIS OPPRESSES WOMEN” which has been making its appearance over the last week on sexist ads in New York City. One place it has appeared (see picture) is a breast augmentation/plastic surgery ad in subway cars that presents a woman looking unhappy with her “small breasts,” holding two tiny tomatoes over her chest and looking glum, next to a happy grinning version of herself holding two large melons to her chest; the ad announces that for just $3900, you can, apparently, cure this depressed condition (caused by ads like this!). 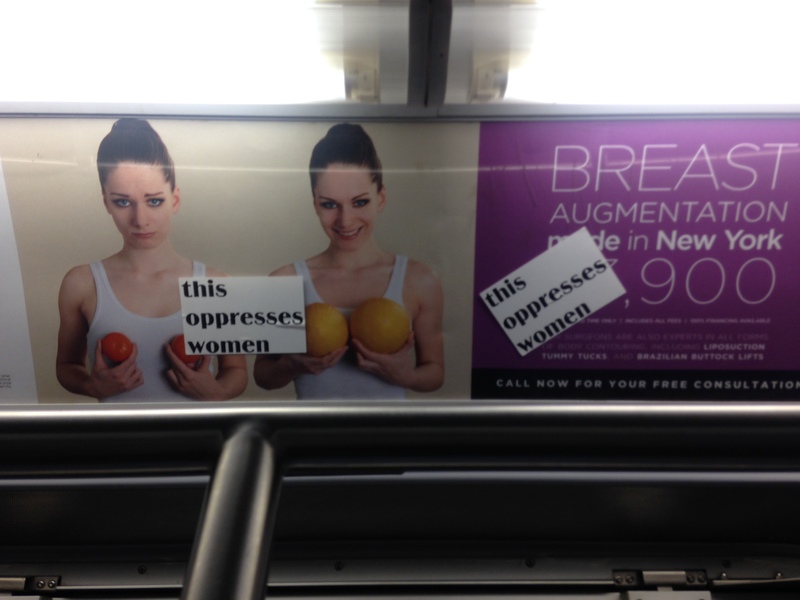 See below for THIS OPPRESSES WOMEN plastered on offensive NYC subway ad. The show will also include feminist music and a wrap up of feminist news, including the latest attacks on abortion rights and legislation passed in New York State that will make it easier for women to report rapes on campus.